The Fellowship for Intentional Community (FIC) recognizes Starhawk as the 2019 recipient of the Kozeny Communitarian Award, honoring of the indomitable spirit of Geoph Kozeny (1949-2007), who devoted his adult life to creating community in the world. makes the case for community as a foundational building block of peace, social justice, and sustainability. From the perspective of this award it‘s notable how much Starhawk has done to articulate the relevance of cooperative culture to modern society, where unchecked competition has resulted in gross imbalances of income and access to resources. She does not just sing to the choir. 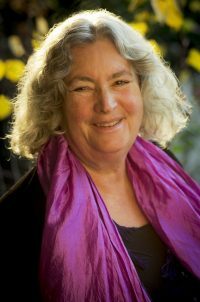 In addition to books, public speaking, and workshops, Starhawk has produced a number of videos, CDs, and audio tapes, which are an outgrowth of her original academic training at UCLA in the ‘70s. With respect to her writing, we want to make particular note of one of her most recent titles, The Empowerment Manual (2011). Different than her other offerings, this nonfiction guidebook is a solid treatment of a complex challenge: demystifying cooperative group dynamics for the lay reader. In addition to explaining how to conduct productive meetings, it tackles the third rail issues of conflict and power imbalances. This book is a recommended resource for any cooperative group. The bulk of Starhawk’s work as a teacher and workshop leader has been focused on permaculture and Earth-based spirituality. In that context she has consistently delivered her messages in a way that promotes group cohesion and develops a sense of community among participants. This is an experience that most humans long for—whether they can articulate it or not—and Starhawk knows how to deliver the goods. 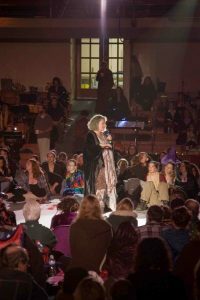 While Starhawk’s experiences in intentional community are less well known than her other work, much of her teaching has been informed by the personal lessons she’s gleaned from decades of group living in the Bay Area. No small part of this award is recognizing the pioneering work she’s done to make the practical tools of cooperation available to the wider culture, where there is a near desperate hunger for positive alternatives to the excesses and abuse that are endemic to competition. Because the need is ubiquitous she travels internationally, lecturing and teaching on earth-based spirituality, the tools of ritual, and the skills of activism. Many cooperative groups struggle to develop healthy models of cooperative leadership, and Starhawk, working through the Reclaiming Collective, has offered training in community-building leadership councils as just such a model. In addition to the impact of her workshops, she advised the organizers who protested against the World Trade Organization in Seattle (1999), is credited with making pivotal contributions to the successful launching of Indy-Media centers around the world, and wrote the call to action for Code Pink (2002), a well-regarded and powerful feminist organization. To her credit, she understands that the organizations she helped found to expand the impact of her thinking—the Reclaiming Collective (1979) and Earth Activist Trainings (2001)—must operate in a manner that is consistent with her egalitarian principles. In short, she must walk her talk to be an effective leader, listening closely to all, and helping to develop the collective wisdom. By all accounts she has accomplished this with uncommon grace, humility, and consistency. Starhawk, for all of the above, the FIC salutes you.